This story was updated at 3:04 p.m. ET. Space shuttle Endeavour – the baby of NASA's orbiter fleet – is poised to roll out to its Florida launch pad Thursday (March 10) to prepare for its last mission, a move that will come one day after the shuttle Discovery returns home from a last flight of its own. Endeavour is slated to head out to the seaside shuttle launch pad at NASA's Kennedy Space Center in Cape Canaveral tomorrow at 8 p.m. EST (0100 March 10), following close on the heels after Discovery's successful landing at a nearby runway. NASA initially hoped to move Endeavour just hours after Discovery's landing, but the threat of rain and lightning tonight prompted at least a one-day delay, the space agency said. Bad weather during the day tomorrow could also add more delays, shuttle launch director Mike Leinbach told reporters in a briefing. 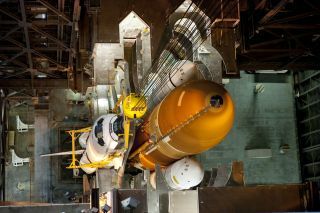 "There's a lot of outdoor work that has to be done to get Endeavour ready to rollout," Leinbach said. Delays with those daytime tasks could ripple through the rest of Endeavour's launch pad move. Endeavour's trip to the launch pad will be broadcast and webcast live on NASA TV, they added. Space shuttle Discovery lands at Kennedy Space Center in Florida to complete its 39th and final flight. The back-to-back space shuttle moves serve as visual bookends for NASA's shuttle program: Discovery is NASA's oldest and the most-flown of all shuttles in service today; Endeavour is the youngest shuttle and still has one more flight left before it stands down for good. "Clearly it's a demonstrable changing of the guard," NASA spokesman Allard Beutel told SPACE.com. NASA's 30-year-old space shuttle program turned a corner with Discovery's last mission, which marks the beginning of the end for all three of the agency's flying reusable space planes. Discovery's next stop will be a museum and the same fate awaits Endeavour and the shuttle Atlantis, which is slated to fly its last mission in late June. Endeavour's STS-134 mission is a planned 14-day mission and includes four spacewalks. The primary goal is to deliver a $1.5 billion astrophysics experiment called the Alpha Magnetic Spectrometer to the International Space Station. The spectrometer is a powerful tool for studying cosmic rays and searching for antimatter, NASA officials have said. The mission is commanded by veteran NASA astronaut Mark Kelly, the husband of Arizona congresswoman Gabrielle Giffords, who is recovering from a gunshot wound to the head received during a January shooting spree by a gunman in Tucson. Giffords is making progress and Kelly has said he hopes she will be able to attend Endeavour's launch. NASA expects thousands of spectators (mostly shuttle program employees and their families) to turn out for Endeavour's slow launch pad trek. Kelly and the mission's pilot Gregory H. Johnson are also expected to be on hand for the event. The 100-ton shuttle, now standing vertical and attached to its rocket boosters and fuel tank, will be hauled to Launch Pad 39A atop a massive crawler carrier that was originally built for the Apollo moon missions of the 1960s and 1970s. It should take about six hours for Endeavour to cross the 3.4 miles (5.4 kilometers) to the launch pad. More than 3,000 people watched Discovery roll out to the launch pad overnight on Jan. 31 for its current flight. Discovery launched on Feb. 24 and spent more than a week linked to the International Space Station while its crew delivered a new storage room and robot. For Endeavour's last trip to the launch pad, NASA has issued more than 900 family passes to shuttle program employees. The move is part of an ongoing project to give employees a chance to soak in major milestones before the shuttle program ends for good. Beutel said everything now depends on good weather for tonight's rollout. NASA space shuttles are particularly vulnerable during the short trip between the cavernous Vehicle Assembly Building – a 52-story building where shuttles are attached to their rocket boosters and fuel tanks – and the launch pad, which has a shell-like service structure to shield orbiters from foul weather. Beutel said lightning and rain are major concerns while Endeavour is exposed to the elements on the crawler carrier. "Basically we don't want to be moving the shuttle at those times," Beutel said. "It can be safely in the Vehicle Assembly Building or on the launch pad. It's that 3.4-mile distance in between we need to be concerned about." This story was updated to reflect a one-day delay to Endeavour's final launch pad trip. You can follow SPACE.com Managing Editor Tariq Malik on Twitter @tariqjmalik.